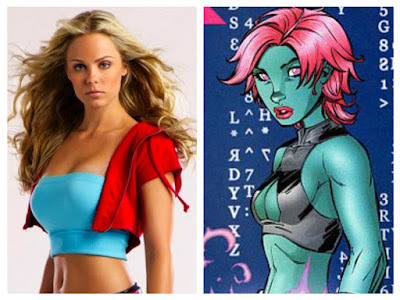 During Monday's Television Critics Association press event while on the 'Supergirl' set, producers announced the addition of Smallville's Supergirl, Laura Vandervoort, as DC Comics' Indigo. She'll play a living supercomputer that was sentenced to Fort Rozz for treason and will now wreack havoc on earth. Vandervoort played Kara Zor-El on the CW's long-running Superman prequel. She currently plays a female werewolf on SyFy's 'Bitten.' She'll begin her recurring role on 'Supergirl' beginning with episode 15. In addition, episode 14 finds Lexi Alexander, director of 'Punisher: War Zone,' taking the helm for Master Jailer's debut played by 'The Young and the Restless' actor Jeff Branson. He'll play a relentless and ruthless jailer from Fort Rozz who's determined to bring in all the escapees by any means necessary. Producers have a fondness for incorporting actors who've played a part in the DC Comics live-action past. Helen Slater (1984 "Supergirl" film) and Dean Cain ("Lois & Clark: The New Adventures of Superman" TV series) have appeared as Kara's (Melissa Benoist) foster parents, Eliza and Jeremiah Danvers.